This mini pumpkin pie recipe will save you from heaping portions of pumpkin pie. I know that many of us don’t want to be rescued but some of us feel we need the help. For example, most American restaurants are out of control. When I was on vacation in Hatteras, NC, I was shocked by the size of the desserts. I believe I was served a mountain of key lime pie one evening. At lunch, they served a boat of cheesecake. Scary. It is pumpkin spice season and I love it. My favorite from last year was my pumpkin angel food cake recipe but I also dig my pumpkin pie smoothie. If you are concerned with portion size, you can simple slice a small piece of pie (testing your self control) or you can make these cute things! Pumpkin pie can be very heavy if you use cream but I decided to use 2% evaporated milk because I think that pumpkin spice is a great flavor. Cream isn't necessary to ensure this dessert is tasty. Pumpkin pie is one of my favorite desserts because it is so easy. Mix and bake! 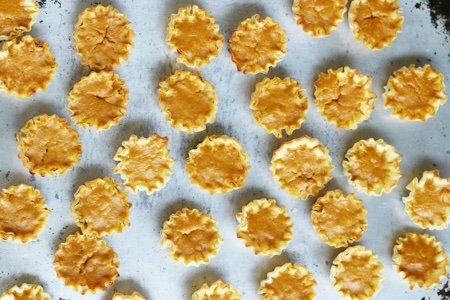 This recipe makes twice as much batter as you need and you can simple fill some ramekins to bake along side the mini pumpkin pies. You really don’t need crust to enjoy pumpkin pie. I call these ramekins "pumpkin custards". The mini fillo shells are found in the freezer section (next to the pie crust) and are a great shortcut. The plastic tray that they are packed in make a little shelf for you to add the pumpkin filling and not have them fall over. 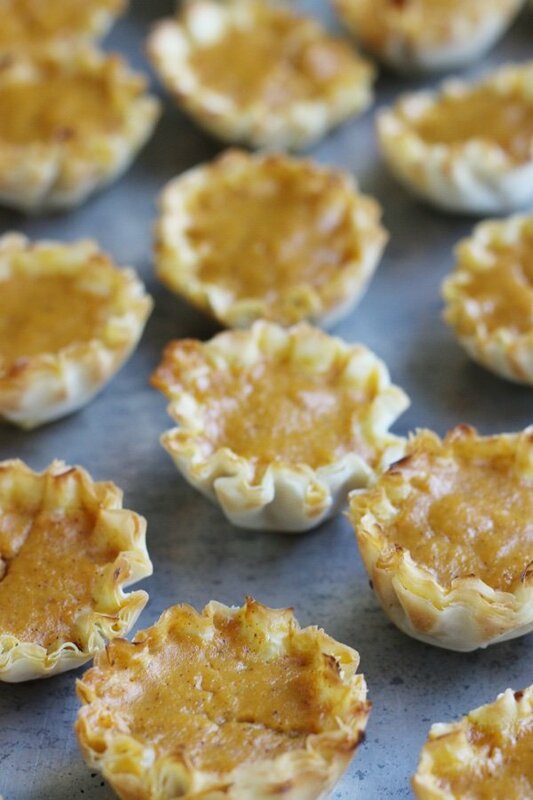 Fill the shells with one tablespoon of pumpkin pie batter, and you can put them in the oven. Don’t you love that? These are a whopping 32 calories each and you don’t need many to feel like you treated yourself. Do make these and eat them the same day as the shell gets soggy when stored. You can freeze these and heat them in the oven to crisp them. Do you make mini desserts? Which are your favorites? 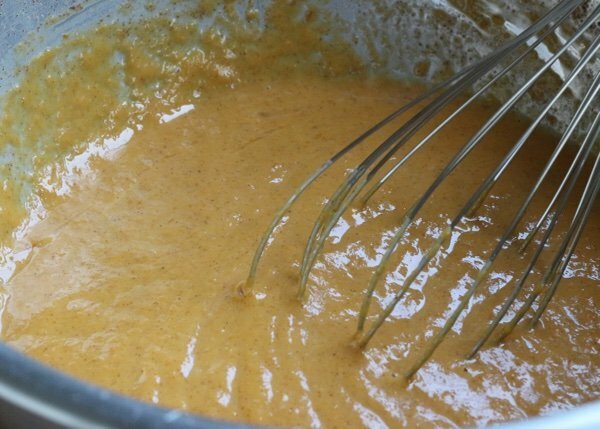 Preheat oven to 350 F. Whisk sugar, pumpkin pie spice, salt, vanilla, evaporated milk, eggs, and pumpkin puree in a medium bowl until blended. 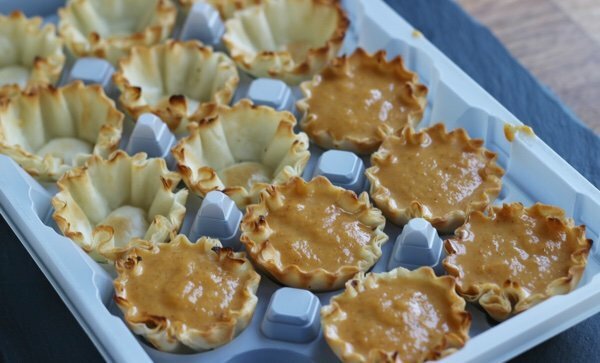 Open up mini fillo shells and fill each one with 1 tablepoon of the pumpkin pie mixture. 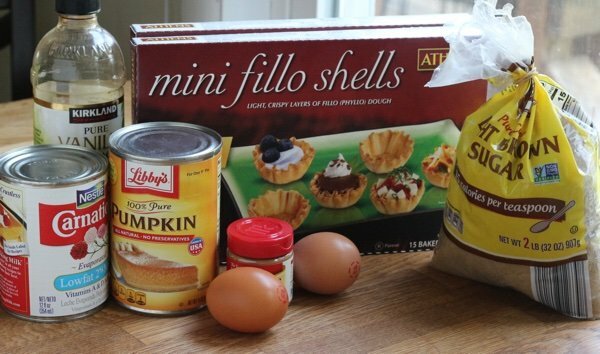 Place filled fillo shells on a rimmed baking sheet and bake for 14-16 minutes until pumpkin is set. Serve when cooled. You will have pie batter left over. You can freeze it for later use or fill ramekins or a casserole and bake it along side of the mini pumpkin pies. Eat like pudding. These do not store well as the fillo dough loses its crunch after one day. So excited to see this! Having work party and said I would make a dessert. This is perfect as I am on Weight Watchers and I will be able to have some. Thank you! I should add that I will be able to make them in work as there are ovens. I will just make the filling at home. I make many small desserts using the fillo shells. Being Diabetic this makes things that I can eat. I also fill them with chicken, tuna or ham salad for appetizers. I keep these in my freezer all the time. These look wonderful. Would there be any reason I couldn't skip the fillo shells and just put in mini cupcake papers or put in custard cup and eat with a spoon? I am gluten free. There are many others on youtube. I think serving pumpkin pie filling in custard cups would be a good way to avoid gluten too. I also watched a crust-less video for pumpkin pie if you wanted to serve traditional wedges. Could you use Truvia brown sugar substitute to help cut out sugar?? Making a real effort to delete sugar from my diet. This sounds delicious! !